The Fobus Sig Sauer P365 Slim AIWB Holster “APN365” is an IWB holster designed for appendix carry or standard IWB carry on your waist. 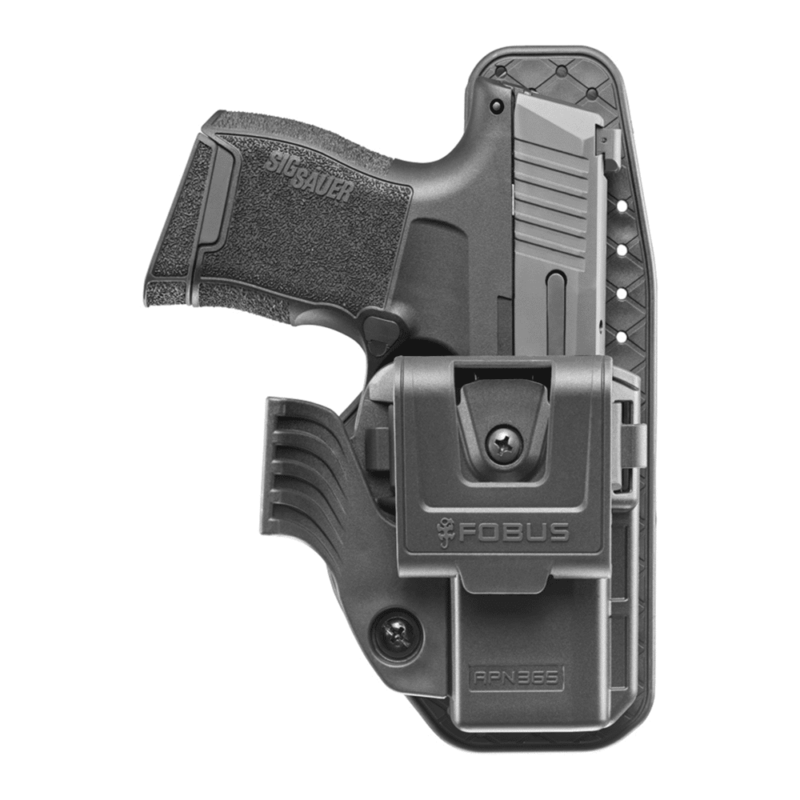 The Fobus Sig Sauer P365 Slim AIWB (Appendix Inside The Waistband) is offered with an adjustment screw for accurate retention pressure and personal preference; a belt clip that allows five cant positions with a simple turn clockwise/counter clockwise; a sweat guard to buffer between the firearm and your body, to assist with better purchase of the firearm and to offer a degree of ventilation, without allowing sweat to pass to the slide of your firearm (the sweat guard is detachable and you may use the holster without it); a concealment wing (available for right handed only) to push the grip of your firearm towards your body for less ‘printing’ (also removable); and finally, the holster is ambidextrous and may be switched to left-hand use without any tools required. The APN365 holster is highly concealable, very lightweight, completely washable, ventilated, highly durable, it is contoured for maximum comfort, and is extremely convenient for every day concealed carry. **the holster is ambidextrous and may be switched to left-hand use without any tools required. Lightweight (Approx. 150 gr / 5.4 oz). Place the holster inside your pants, in a location of your preference. The holster may be used for appendix carry or for standard IWB carry on your waist. Make sure the belt clip is outside your pants and over your belt, while its lower hook is catching the belt from underneath.